You can listen to a livestream of this content at http://bit.ly/easyengagement. What is social media engagement? What does it mean, how in the world do you get it and how do you increase the amount you have now? Social media engagement means that people are “talking” to you in some way on social media platforms. This can take the form of likes, comments, shares, retweets, emojis, actually hopping on someone’s livestream, etc. It’s a way for folks to acknowledge that they see/hear you, they like your message, they're reading your blog post, and they support (or don’t support depending on the comment) you. In short, it means that you’re visible to them and you are becoming top of mind! If you don't have many people talking to you and thinking of YOU when they think of your industry, then you’re really not being remembered…you’re simply invisible online! 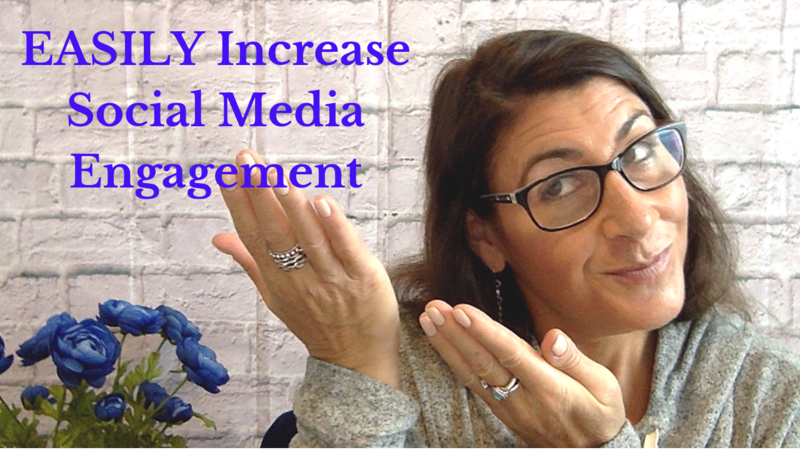 In this blog, I share several easy-to-apply actionable techniques I use that YOU can do to increase your social media engagement. 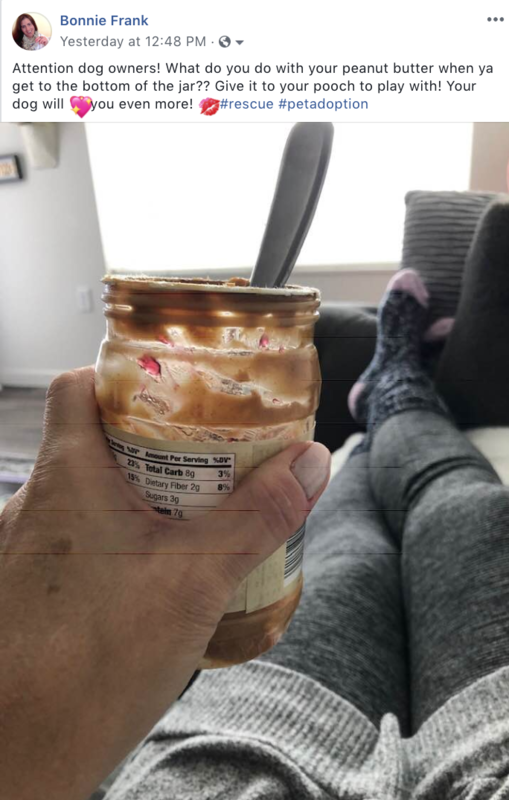 Here’s a photo I posted on Facebook recently where I’m lounging on the couch holding an empty peanut butter jar. WHY would I post that on social media? I posted that because I was thinking if I still had a dog I would give her that peanut butter jar and she would go to town! Dogs love peanut butter and it’s a wonderful, busy activity for them that is also a brain activity for them. It’s great problem solving for their brain development, good for their bellies and they will love you even more if you give it to them! I posted that on social media to shout out support to the local Animal Protective Association (APA), to support pet rescue and adoption, and to approach my social media marketing from a different angle by attracting different types of followers (dog lovers). 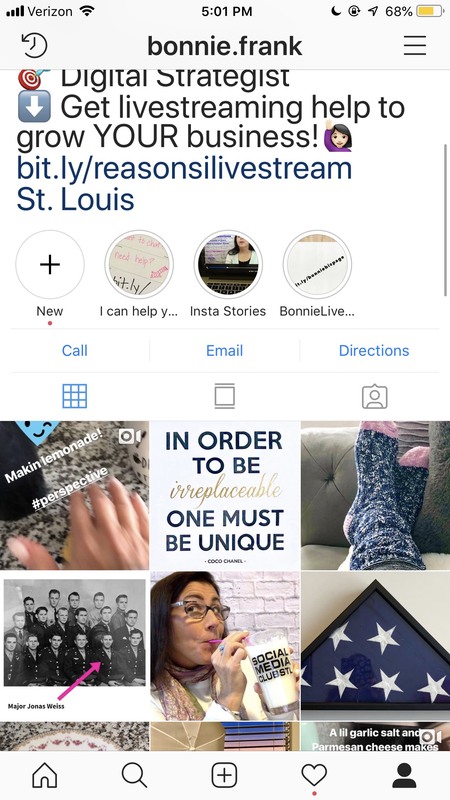 I heard the head of the APA speak the day before at a marketing conference, I had already quoted her and shouted her out on Twitter (@APAofMO) during the conference, and this was an additional way for her and APA supporters to hear my name and see what I do – LIVE! Letting people know that you're interested in things besides your particular industry is very good business because it increases the Know-Like-Trust factor and allows people to know you as a person, not just a businessperson! Not only did I share this livestream on several social media platforms, but I also forwarded it to and pinged Sarah Javier, the head of the APA so she’d see the broadcast and know that she and/or the APA was mentioned. I mentioned that I used to have a dog and four cats (yes, all of them at the same time! ), that they were all rescues and adopted, and two were from the APA. During the broadcast, I also mentioned the conference Sarah spoke at, the St. Louis Digital Symposium #STLDIGSYM, and shouted out the head of that conference, Jeremy Corray from Ad Club St. Louis #AdClubSTL. By mentioning and pinging them on the Facebook livestream post, it created more engagement in terms of many more views (without paying to boost the post), comments, and followers. One livestream and a couple of relevant shout outs. Easy! If you haven’t been as active on social media as you’d like, this is a great technique to increase engagement; however, the shouts out and post mentions must be relevant in order for it to not be viewed as spam. You can get people to notice you and interact with you by tagging them in a Facebook post (up to 50 in the comments) and on Instagram (20 people on a post, 10 in a story). In the first photo, you’ll see the “In order to be irreplaceable, One must be unique” post from Instagram. I tagged 16 different people on the post directly, which you can see from the second photo. I could have also shouted them out in the comments. Either way, Instagram notifies the folks you tag that you’ve tagged them so that you go to the site, view the post and, ideally, comment back. Some of the people I tagged were coaching clients, and others were women I’d just met the night before at a local Women's networking event. We exchanged business cards and this was one of the ways I followed up after meeting them. This particular post was relevant to each of these women, so I thought ahead and took the opportunity to tag them when I created it. It’s a great reminder for them that they met me and that I do business coaching and social media marketing. I also followed up on each of them with an email, but people receive a lot of emails these days and many end up in their Spam folder. Tagging is a great way to get noticed, get remembered and stay top of mind beyond the emails. 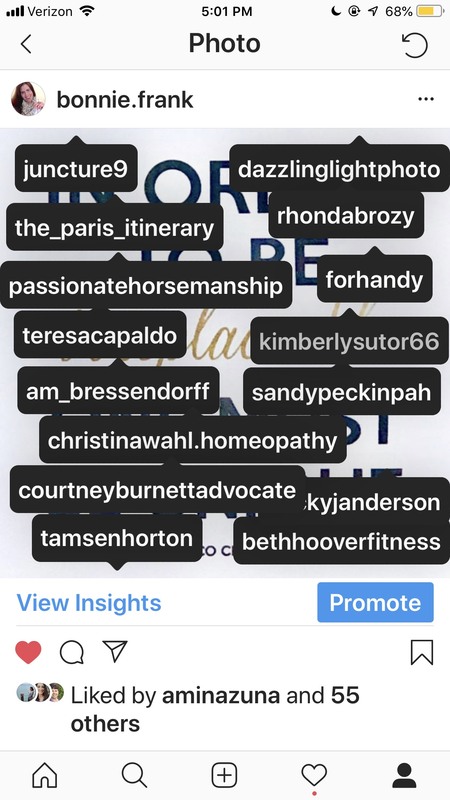 I do not suggest that you tag the same people on each Instagram or Facebook post you create, but tagging folks for relevant topics is good business because it shows them you’re thinking about them. You can also tag celebrities and that can certainly get their attention, but please make sure the content is relevant to who they are and their interests. Another way to increase your social media engagement is to combine two topics or ideas that aren’t ordinarily thought of together. As you can see from this photo, I wrote a blog post entitled, Online Dating Is Social Media 3.0, where I explain how online dating is simply another form of social media. I use online dating and because I approached it in this way myself, it never scared me and it was easy for me to have good results and great dates. Online dating has always been a positive experience for me because of this approach. During the Digital Symposium, I tweeted like a madwoman for four straight hours! I really enjoy supporting the events that I attend and tweeting from them. I quote speakers, tweet about the content, post photos, etc. I also put some of these photos on LinkedIn and in my Facebook and Instagram stories. I definitely helped market that marketing event! I tweeted, replied, retweeted, shared, bookmarked and liked for four hours. 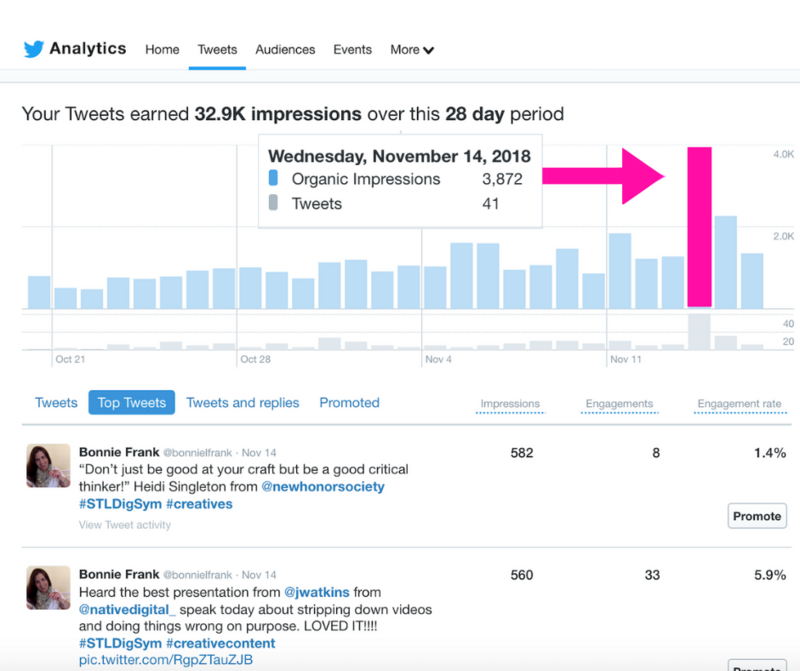 You can see the difference in my Twitter engagement when I did this: Almost 4,000 impressions in 41 tweets. (I could have had even more Twitter engagement, but I was also listening to the speakers, taking notes and posting on other platforms during this time.) Not only did I have more impressions, but my tweets got retweeted, favorited and I picked up many more followers. I was also contacted by many other marketers and people in my industry who I didn't know before that event. This increased social media engagement lets people know who I am, what I do, and keeps me top of mind. Perhaps they’ll come to the livestreaming panel I’m participating in at the 2019 Midwest Digital Marketing Conference #MDMC19 in the spring! These techniques all very easy to apply and will increase your social media engagement! They simply take a little more planning, some hashtags, and action. Tag people in your Facebook group if you want to increase engagement in that group, as well. Participate in groups, like, share, and comment on other peoples’ posts. Let them know you’re interested in them and their story and provide interesting and relevant content. If you’re consistently and strategically present on social media, the ever-changing algorithms won’t get to you and your engagement will increase over time. If you have any questions or comments about increasing your social media engagement, please leave them below! I’d love to hear from you!